These days, marketing dollars continue to be tight and competition is fierce—insurance consumers increasingly shop online in search of the best deal. Determining where to invest limited marketing spend to attract and convert the right consumer at the right time has never been more challenging. Not surprisingly, marketers continue to allocate precious advertising dollars to digital display ads. In fact, U.S. advertisers are expected to double their spend on digital display between 2015 and 2019. 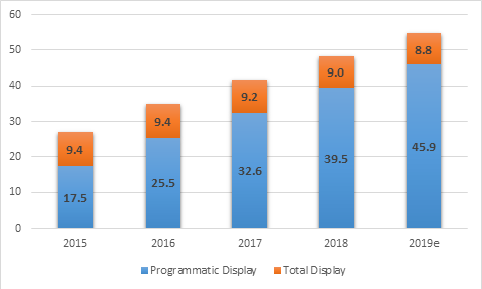 Interestingly, programmatic display purchases have driven that growth. In 2019, the proportion of display ads represented by programmatic is estimated to be 84%. Programmatic display advertising allows an advertiser to leverage data and algorithms to feature display ads that speak to an audience of one, and purchase those ads in a manner that best aligns with anticipated ROI. Device and platform agnostic, programmatic display ads can be applied across delivery channels and media types to reach the right customer with the right message for the right price. Programmatic display has two unique advantages over regular display advertising. First, it is more efficient because it eliminates the need for human interaction. There is no need to engage with a middle person or negotiate pricing. It is all automated. Second, and most important, is relevancy. 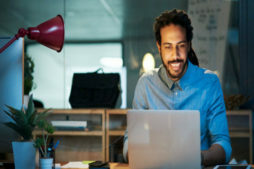 By combining online data (such as a customer’s online behavior) and offline data that has been matched to a digital cookie or device ID (such as a customer file or rich demographic and interest data aggregated by third parties), an advertiser can create a customized message targeting a single individual. Programmatic advertising is not new within the insurance sector. However, the opportunity now exists to further refine programmatic display targeting by applying insurance-specific data, such as conversion propensity and lifetime value. The application of insurance-specific insight adds another layer of intelligence, enabling you to target more effectively the right customers for your business, and, by doing so, positively impacting your marketing ROI. By establishing the optimal balance between customer criteria and marketing spend, programmatic display advertising can be the key to attracting and retaining the right customers with the right message for the right price. There is another important feature of crucial significance, and that is the ability to understand the broader impact. Click-through ad responses are easy to measure but are infrequent and may only tell a part of the story. How do you know if a campaign is performing? LexisNexis® Campaign Analyzer is able to attribute online and offline conversions to a digital campaign without a policy file and without adding code to a carrier’s site. In addition to providing conversion information for auto campaigns, Campaign Analyzer can reveal the shopping behavior caused by the campaign to give a more complete picture of campaign effectiveness. Are you getting the most out of your digital campaigns? Can you close the loop and attribute your digital campaigns to accurately report your marketing ROI? Download our latest infographic to learn more about how LexisNexis Risk Solutions can help you optimize your digital insurance marketing campaigns.